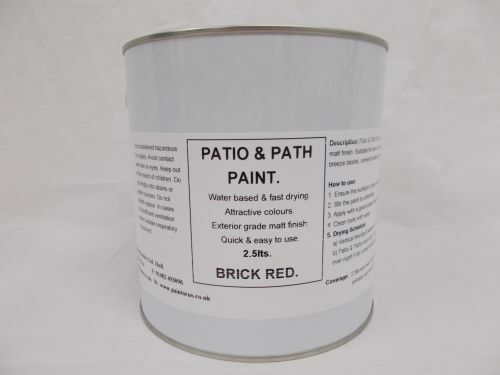 2.5lt Patio, Path & Paving Slab Paint Garden BBQ Tarmac - Brick Red - Paints R Us - Number 1 Supplier of your Paint Supplies - We supply paint FAST!! Makes your patio, path and BBQ area look like new. Renovates and restores exterior patio’s, BBQ base, paths and similar hard standings. Suitable for concrete, tarmac, paving slabs, stone, asphalt & timber etc. Modern water based technology for ease of use and fast drying. Easy to clean, hard wearing and anti-slip finish. 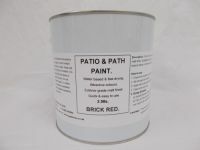 1 x 2.5lt tin of top quality patio paint for exterior use. Using modern water based resin technology that dries to a tough, anti-slip, matt finish. Formulated with light fast pigments to provide an excellent finish to exterior patios that will last for years. This product also has excellent resistance to water, mould and fungal growth. Stir well prior to use. Surfaces should be clean and dry. Apply with a good quality brush or roller. NOTE:New concrete will need Etching prior to painting to ensure good adhesion. If you require a colour card please let me know and I will email one to you.